According to this Music Radar [article](http://www.musicradar.com/us/news/guitars/rory-gallaghers-gear-the-key-guitars-amps-and-effects-546815/10), "Rory’s go-to slide guitar during the first few years of his solo career due to its sharp tonal qualities. There’s a ’66 marking on the neck, but some sources have it as a ’67 model. He always paired it with a half-fingered brass slide." It also mentions that this telecaster was used on the albums Rory Gallagher, Deuce, and Live in Europe. Glenn Frey can be seen playing his White Fender Telecaster at 0:17 on the vodeo 'The Eagles Take it To the Limit live at Washinggton 1977' on Youtube. 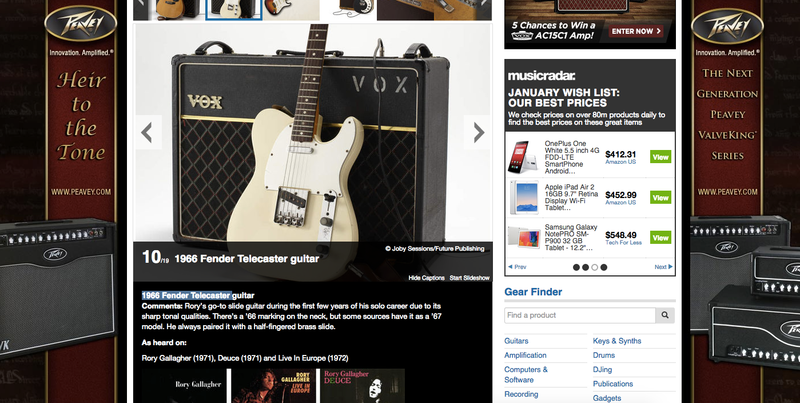 This photo from Hilton Valentine's personal website shows him playing a white 1966 Fender Telecaster, which is corroborated by an anecdote on [his site](http://www.hiltonvalentine.com/equipment.html). No reviews or videos yet for 1966 Fender Telecaster White. With an Equipboard account you can rate this item, add it to your collection, submit a review to discuss what you like and dislike about it, and associate 1966 Fender Telecaster White to artists that use it. Create an account!